Buying lunch every day gets expensive – we all know this. I’ve become very good at bringing my lunch every day once it dawned on me that I was spending at least $7 each day, adding up to $50 a week … and you can do the rest o’ the math. My current fav sandwich is turkey with a black olive tapenade. It’s easy to make, tasty and protein-ful, too. I bring an apple to help out with the tally of fruits & veggies I’m supposed to be eating every day. On recent days when I’m either slacking or lazy (are those the same thing? 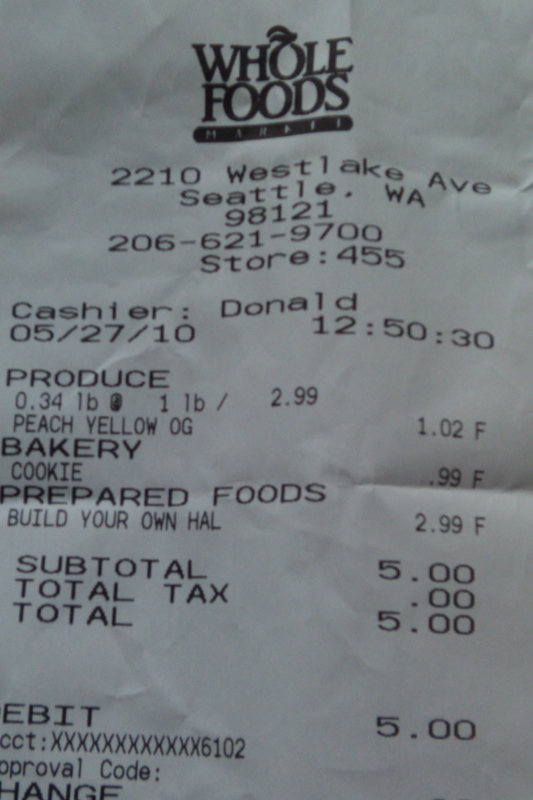 ), I have successfully purchased several $5 or under lunches, at Whole Foods (!) and the Great Northwest Soup Company … both located in S. Lake Union near the office. The $5 even includes dessert/ a cookie on some of my ventures. Evidence from the $5 lunch purchased at Whole Foods. How can you repeat this feat? If shopping at Whole Foods, a good example is to go with a half sandwich, for the main course. The meat and other portions are large, so it’s really not skimping. I like to get the tuna salad (Mediterranean, with kalamata olives & artichokes, or you might choose cranberry) on wheat with lettuce and tomato. I grab some fruit (most recently, one organic yellow peach) and a chocolate chip cookie. A slice of pizza and a piece of fruit also falls under the $5 category. At the soup company, a great recent less-than $5 find (thanks to a fellow customer) is to purchase the small Greek salad (again with the olives, I know) and asking for chicken, which is sliced fresh and placed on at the counter. You’ll have your choice of bread, then, including a cornbread muffin (no Betty White jokes, please). I have to say I’ve been pretty proud of these finds, and once I got this amazing receipt the other day – $5 exactly – I knew that I needed to blog about it. Happy not Whole paycheck, y’all.